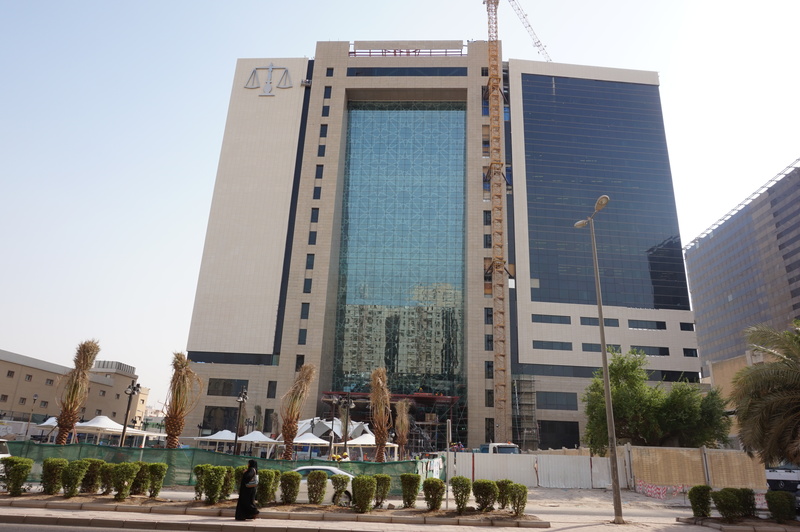 When it is completed in summer 2016, the new high-rise court complex in Al Farwaniya, a suburb of Kuwait City, will house 80 state-of-the-art courtrooms, a host of governmental and administrative offices and a number of public spaces and cafes. Architecturally, the building is designed to reflect the strength and transparency of the Kuwait justice system and, appropriately, glazing will play a starring role. Arguably the building’s key design feature is a 20-metre-wide sloping glass wall rising above the main entrance to a height of 70 metres. The architect’s vision of a soaring, apparently unsupported wall of glass of this size presents a significant challenge from a glazing perspective, especially because the system would also be required to stand up to high mechanical loads to help safeguard the security of the building. A steel tension structure supports the system, and the glazed units are attached to this with special high-load capacity articulated Pilkington Planar™ 902 Double Glazed laminate stainless steel fittings. To deliver the required strength, each of the double glazed units were made up of three layers of toughened glass. An outer 12mm pane is separated by a 16mm air-filled gap from an inner laminated pane made up of two sheets of 6mm-thick glass, sandwiching a high-strength interlayer. Phil Savage, commercial contracts sales manager at Pilkington United Kingdom Limited, said: “In terms of standing up to mechanical loads, this is one of the toughest glazing systems we have ever developed – not least because of the large surface area over which it needs to be resistant. Along with the need to be tough, the architect also had some challenging aesthetic and environmental criteria for the glazing. The glass leans outwards from the base at an angle of just under 10 degrees, and this needed to be taken into account when designing the stainless steel fixings that hold each unit in place. The glass also features an arabesque manifestation which was screen-printed onto surface three of the system, providing one of the building’s most striking architectural features. The large repeat of the pattern chosen by the architects meant that units had to be carefully printed and installed in the right order. Of course, the climate of Kuwait means that controlling the temperature inside the building can be more difficult, and with such a large portion of the building’s envelope being glazed, solar control was essential. A Pilkington Suncool™ coating was applied to surface two, cutting the transmission of solar energy through the glass to just 25 per cent while maintaining 50 per cent transmittance of visible light, so occupants of the building will be able to enjoy the view without suffering from overheating. Chris Barlow, International Pilkington Planar™ Sales Manager at Pilkington Architectural, said: “When it is completed, the court complex will be a major new landmark for Al Farwaniya. The large structural glazing element provides the building with a suitably outstanding design feature, as well as flooding the public lobby with natural light.